You rarely hear about 'milk stout' these days, a drink containing lactose which is a type of sugar derived from milk - although perhaps those involved in the craft-beer circles would know a bit about it. Because the lactose does not ferment, it makes the stout quite sweet so the taste is a little different than the well-known stout brands we are used to. I recently read an article about brands that survive without having to advertise, and 'Mackeson milk stout' was on the list. It is still for sale in a few big supermarkets, in the UK at least. They did some advertising at one time however, and you often hear some older punters refer to today's Grade Three BetVictor Gold Cup Handicap Chase at Cheltenham (2.25) as the Mackeson Gold Cup, even though the sponsorship ended 23 years ago. Arkle famously enjoyed some stout with his oats. I'm not quite sure if Martin Pipe was giving his horses a drop of the black stuff but he managed to become the most successful trainer in the 'Mackeson', with eight wins. Son David has two runners today, namely King's Socks and Eamon An Cnoic, the former horse being the stable's main hope. 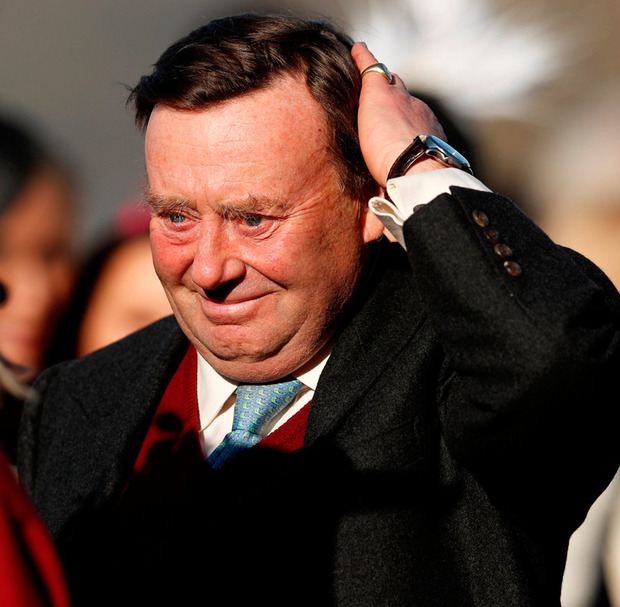 Nicky Henderson has entered 26 horses in this race in the last 20 years, winning once with Fondmort in 2003, and he'll be hoping Rather Be can improve on that record in this year's renewal, with the seven-year-old trading as the 9/2 favourite at the time of writing. He hasn't been seen since finishing second in one of the handicap chases at the festival here in March, having traded at 4/6 in-running before being collared by Mister Whitaker. That horse re-opposes today but is up 15lbs to 152 which makes his price of 5/1 seem a little short. Rather Be is up 6lbs to 149 which makes him a more attractive option but I also feel he's a little short in what looks a very open race. Paul Nicholls, who enjoyed a great weekend last week, has had two wins in this race with Al Ferof (2012) and Caid Du Berlais (2014) but he's had nine horses placed from his 36 runners in the last two decades - not a bad record overall. Nicholls saddles three including the top-weight Frodon, and Movewiththetimes, which is yet to win over fences, but I'm quite keen on his other entry Romain De Senam, which was trading at a nice price of 25/1 in the early markets yesterday. Rated 138 for a racing weight of 10st 3lbs, he comes here on the back of a third place in a handicap chase at Aintree last week in which he raced a little too freely off the same rating. Things just didn't go to plan for claimer Lorcan Murtagh but I reckon he's worth another chance at that price, with Harry Cobden set to take the reins this time and the hood back on. I often like to have two running for me in the big handicaps and I'm going to have a punt each-way on Rebecca Curtis's Geordie Des Champs, which was trading as high as 40/1 in places yesterday. He looked a little rusty on his reappearance at Ascot last time but he's raced reasonably well before above this rating, so is not without a chance at a nice price. On the all-weather at Lingfield, I reckon Gifted Master is a cracking value bet around 3/1 for the Listed Betway Gold Rose Stakes (3.15) for trainer Hugo Palmer. The son of Kodiac won this last year at 9/2, and although he flopped in a Listed race at Newmarket last time, that effort is forgiven as it came on the back of a hard-earned win in the Stewards Cup at Goodwood, so he may have been a little weary. With 11 wins from 27 runs, you almost always get a run for your money.